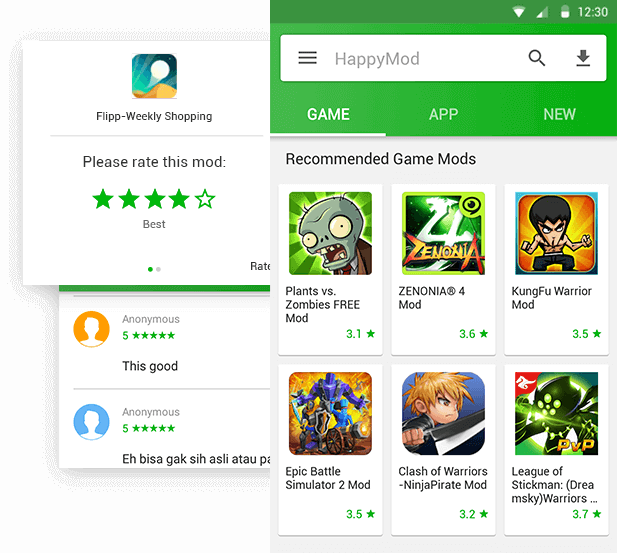 HappyMod is paltform for mod lovers to download, request and test android mods. HappyMod don't make the mods, and all the mods came from internet.Over 30,0000 android app mods can be downloaded here. And we will add more android mod apps. Keep all the mods in HappyMod 100% working is our goal. How to achieve this goal? We will provide large number of mod app for user to test. Then we pick out those really working mod. We will also mark these mods accordig users' feedback, so that it will help our users to select best mods. Can't find the mod you need? You can have a request about the mod you need. We will inform you as soon as we get it.If you found the mod is out of version or not work for you. You can have a request for update here. HappyMod is the best place for mod lover! Welcome! Verifty Millions of downloaded users comment the mods to help us picking out the best one. 100% working We recommended the 100% working one to happymod. This app is really awesome ,love it and also its easy to use.